Creamy, soft and chocolaty indulgence – this is the best chocolate cake you ever have tasted! This cake only has 4 ingredients – maybe it is the simplicity of this cake that makes it so amazing. With its soft creaminess it reminds one of mousse au chocolat crème. For a perfect consistency you need to melt the chocolate and butter au bain-marie – which is the fancy term for: above hot water. So in a nutshell: 4 ingredients, no flour, no difficult steps. Still, it is probably the best chocolate cake you have ever tasted. What are you waiting for? Get started and impress some guests! So delicious, but so incredibly easy to make! You only got 4 ingredients, what could possibly go wrong? Preheat an oven to 160°c (fan works best). Line the bottom of a springform tin with parchment paper and butter the sides of the tin. This will help the cake to loosen from the sides once baked. Heat a pot of water as you will need to melt the chocolate and butter au bain-marie. Break chocolate into pieces and cut butter into cubes. Put a bowl on top of the pot with the simmering water. Insert chocolate and butter, stir occasionally to make everything melt evenly. Once chocolate and butter are fully liquid and mixed, remove the bowl from heat and let cool for 10 minutes. 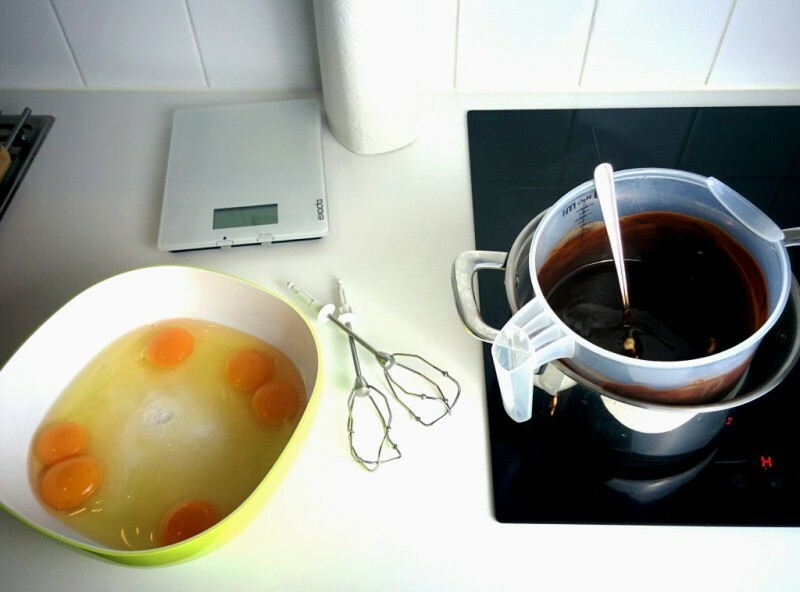 Crack the eggs in separate mixing bowl, add the sugar and mix with until white and creamy. Do this by hand with a whisk (if you dare!) or take the easy route and use a handheld mixer (that’s my usual approach). Add half of the molten chocolate mixture to the eggs. Use a spatula to carefully fold it in, without removing too much air from the eggs. Add the second half of the chocolate mixture and fold in as well. Put your batter into the lined springform and bake in the oven for 1 hour. Don’t worry about doneness too much. You want your cake to be slightly fudgy! If your cake gets too brown (it shouldn’t), cover with aluminum foil. Let the cake cool overnight in the fridge and share with some loved ones! Extra tip: Make this treat even more perfect by adding a little pinch of salt to the melted chocolate. This just brings out the flavor of the other ingredients even more! Tell me in the comments what you think of the recipe! Did I promise too much?